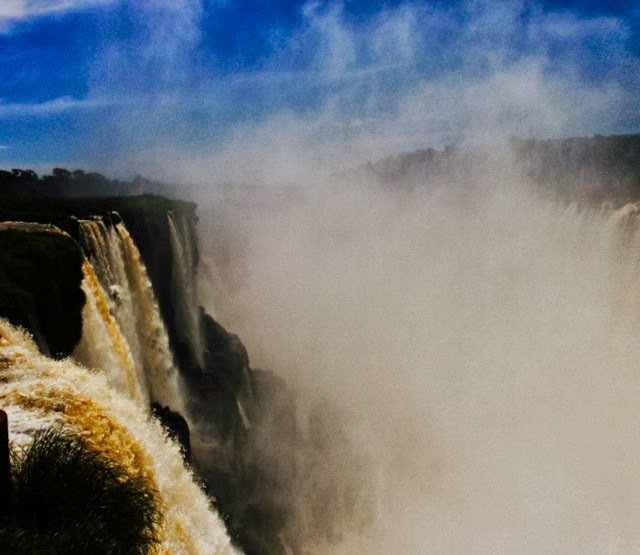 I had dreamt for many years about going to Iguazu falls. 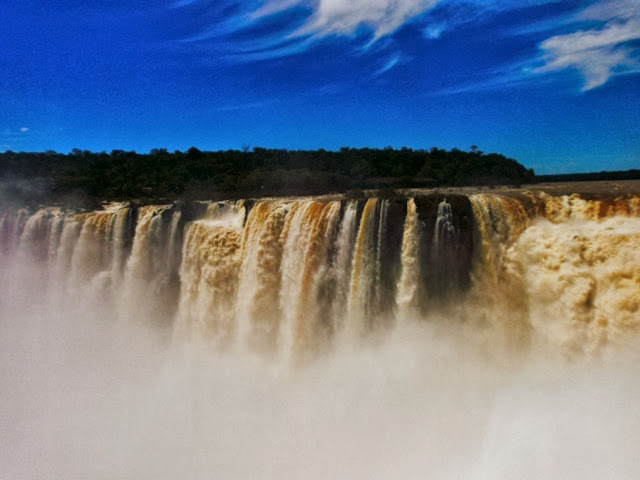 They are a seventh wonder of the world and one of the biggest waterfalls in the world, even bigger than Niagra falls. The time had finally come! I was sad leaving Buenos Airies that had felt like home for the past 17 days, but I was also excited for what lied ahead of us. We opted to fly to Puerto Iguazu as we’d had enough of bus rides by this point and just couldn’t face the 18hr bus ride to get there. Plus we managed to find a cheap flight (always check sky scanner) we arrived early morning and was greeted with big smiles and kisses on both cheeks by the guy working at the Mango Chill hostel we were staying at. It was an awesome hostel with a pool and lots of friendly guests and staff. I must say it was a bit of a shock going back into a dorm room after living it up in our apartment in BA. We caught the 20min bus to the falls nice and early and arrived not long after the park had opened to avoid the crowds. Our hostel had given us a map of all the walking trails and told us which ones to do in what order and the best times of the day for the view points when the sun is in the right spot. Despite all this we still got caught up in lots of tours groups and did our fair share of waiting our turns to take photos but really, what else can you expect when visiting a seventh wonder of the world? Some view points you were basically right under the falls and the further out you went the more soaking wet you would get it. There were lots on children in their swim suits running around, laughing and getting completely drenched. It was very cute! You can also take boat trips that take you right under the falls. They weren’t running the day we went as the water levels were too high. Our last view point was called the Devils Throat. It was quite a long walk up there so we got the tourist train. At one point the train drove through hundreds of yellow butterflies, it looked so magical! (Even though I’m scared of butterflies haha) I’m glad we kept the devils throat til last, save the best for last as they say! 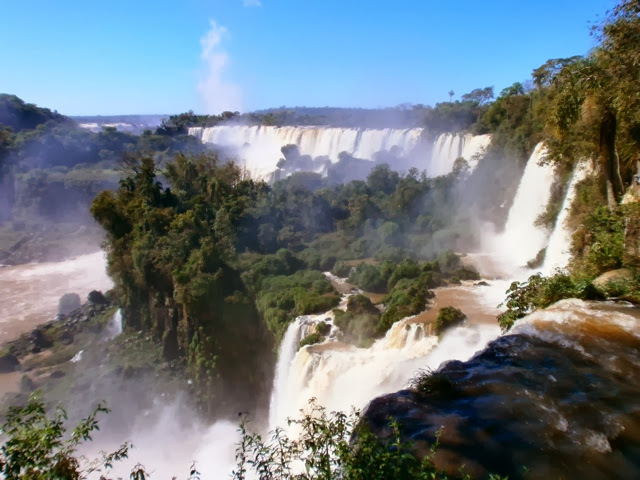 This was the view point most postcard photos for Iguazu falls are taken. It was quite windy by this point so we got absolutely soaked, it was like it was raining. The view was so stunning, I didn’t mind getting wet one bit. 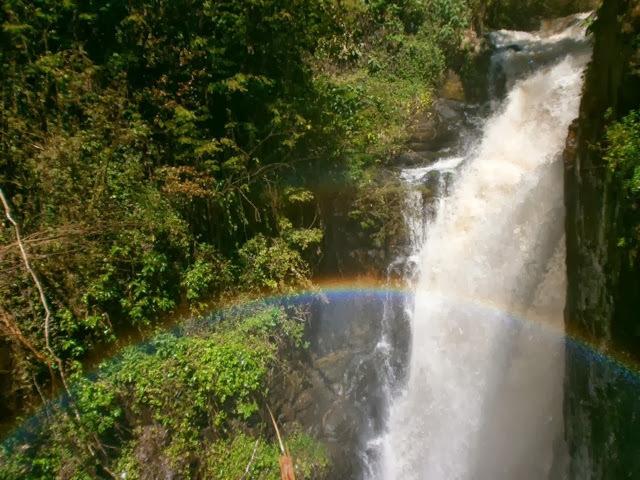 We spent 6 hours wondering around the falls and soaking up the views, I could have easily spent longer. I left that day feeling so happy, blessed and completely on top of the world. I am so grateful that I can keep living out my dreams and experiencing so many different things each day. 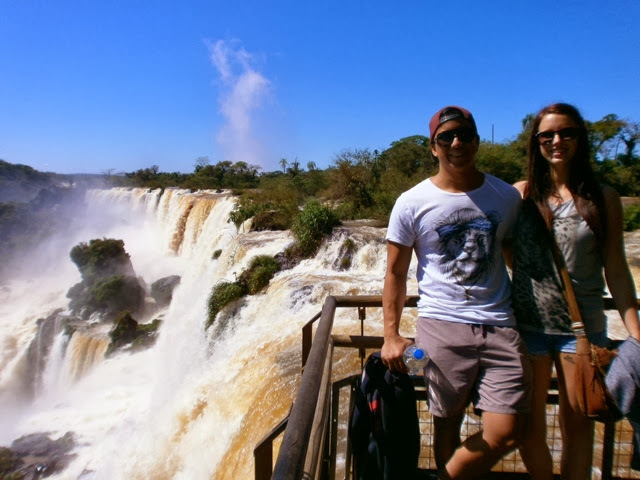 If Iguazu falls isn’t on your to ‘do list’, I recommend you put in on there right away! Unfortunately for us, our Brazillian visa wasn’t approved same day and we had to spend hundreds of dollars to change our flights. We had lots of problems with it but the people at our hostel were extremely helpful and even came to the embassy with us at one point to beg in Portuguese for us to get it the same day. The amount of times we have experienced this sort of kindness from strangers during our trip is just amazing. 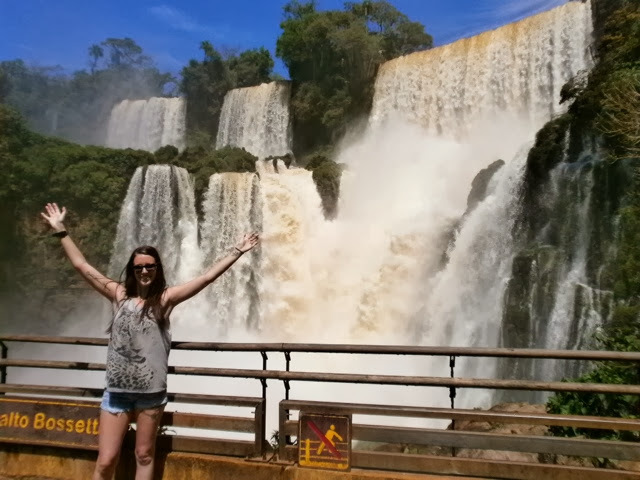 We didn’t manage to see the Brazillian side of the falls as we lost a day but never mind, at least we got our visas in the end. Lesson learnt, always do your research properly!